Berlin-based experimental knitwear designer Goran Sidjimovski is pushing the limits of yarn—fashioning garments that present striking lines, shapes, and textures while exploring a queer narrative. Sidjimoski’s graduate collection, Liminal Lines, delves into the liminality of gender, featuring pieces that present ambiguity and flexibility in concept, straddling the line of masculine and feminine. 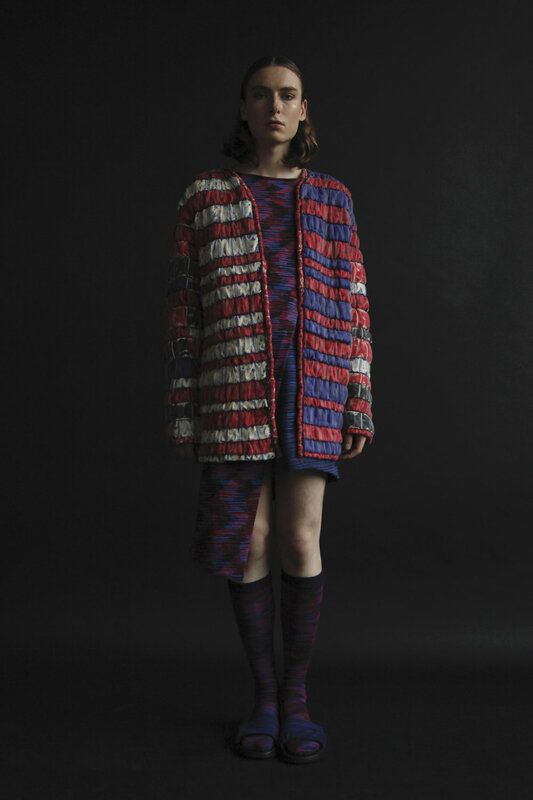 DRØME: What drew you to create this knitwear collection? Goran Sidjimovski: I discovered knitting during my fashion studies at the HTW Berlin and became obsessed with it. I spent hours, days, and nights at the studio just trying out different yarns, experimenting with structures, or going through knitting books and machine manuals. What drew me most to knitting is its complexity and the design freedom it offers. I find it utterly exciting starting only with a cone of yarn and making a garment from scratch. During my placement semester I interned at the machine manufacturer company Stoll and got interested in programming and the more technical side of knitwear. That period opened a whole new world of knitting to me since the company has a very experimental approach and the goal is to always put the machine to its limits and push the boundaries of what knitting can be. Following that experience I became more interested in knitting as textile and decided to do an entire graduate collection with knitwear. How did you arrive at the concept for this collection? Was liminality within gender a topic you had been wanting to explore? I was tackling the concept of liminality in terms of migration for a long time and found in it space to analyze my personal experience as a migrant from a different perspective. Working with and around its discursive elements has allowed me to reflect upon other situations; when you don’t feel quite at ease, uncertain threshold periods, or when you are walking a line in which the endpoint is unclear. At the time I was also reading a lot of queer theory and at one point I decided to change direction and work with liminality in relation to gender and queerness. I also felt that moving in this direction would result in a stronger visual story. Books like Sara Ahmed’s Queer Phenomenology and Jack Halberstam’s The Queer Art Of Failure have become a great source of inspiration for the development of the collection. Thinking with these authors the whole process turned into a sort of a balance scale between dismissal and embracing. Dismissing seasons, dismissing gender, dismissing norms, dismissing the binary. The dismissal of the normative allowed me to fully embrace the beauty and creative potential of discomfort, disorientation, and simply queerness. Being queer or refusing to dwell into specific gender is also a liminal category and I think that fashion here plays a great role as a straightening device. Fashion is of course often related to freedom of expression and independent choices, but I think that the normative connotation of femininity and masculinity is still very much present, and unfortunately too powerful. The collection was in a way an attempt to portrait the feminine and masculine not as binary opposites but as inhabiting the same space at the same time. Are you more interested in knitwear as art or fashion, or do you consider them one and the same? I like knitwear as fashion, but at times I feel that my possibilities are limited due to the functional requirements of garments. Lately I am getting more interested in knit as sculpture and knit for interior design. I usually keep the knit development process separated from the research. I constantly work on new structures and swatches and when I’m sure what matter I want to work with I go through my knit archive and select structures that correspond to the concept and can be further developed. So, I guess it really depends on the topic which medium I will use. For the current collection fashion fit perfectly. What else has influenced you and your work? My line of thought is strongly influenced by theoretical concepts, words, meanings, and interpretations, so books are the most important medium for me and a constant companion to my work. I hardly ever use visual references, and when I do I tend to deconstruct the source and work with the bigger picture outside of the frame. Music is also an important element in my life, but until now only as a crucial support system throughout the working process. While I was working on this collection I had Arca, Björk, and Sevdaliza on repeat for six months. After graduation I moved immediately to Madagascar for half a year and work here currently as a knitwear design assistant. It was a rather spontaneous decision that turned out to be a great reflectional period and prolonged transition between student and work life. I am also thinking about the next topic I want to explore and it seems that the starting point for the upcoming project is going to be Foucalt’s Discipline and Punish. I am excited to see how this will evolve and how I will translate it into knit.